Recently, the Nolitan attack against the San Gennaro Feast kicked into high gear. As DNAInfo reported, "NoLita residents and merchants seeking to rid their neighborhood of the annual San Gennaro Feast scored a victory last week when Community Board 2 penned a letter to the city's permit office urging them to cut off the 85-year-old festival at Kenmare Street, the de facto border between Little Italy and NoLita." Nolita, of course, did not exist until it was invented, carved from the body of Little Italy by the Gods of Real Estate in 1996. Coincidentally (? ), that same year, Giuliani took "the spirit out of the festival" with a City Hall crackdown ostensibly aimed at organized crime. The die was cast. Nolita didn't become a powerful lobbying force until the past few years, when its massing troops set out to destroy whatever remained of vanishing Little Italy. Just look at what they did to Elizabeth Street--the forces of upscale retail are fierce. Said one new shop manager about the feast, "You don't want people coming in with greasy sausage fingers. And it always seems to clash with Fashion Week--a busy time of year for us." It may be inconvenient for the new boutiques, but the Feast has been going strong in this neighborhood a little bit longer than Nolita--since 1926. Of course, many of the newest New Yorkers have a short memory for these things. Martin Scorsese recounted this story from a trip to DiPalo's Food Shop, "Last time I was there, [Mr. DiPalo] told me some student who had just moved to the area came in and asked him, ‘What made you open an Italian cheese shop in a Chinese neighborhood?'" The main arguments against the Feast ignore history. The opposition says, in sum, "It has lately become too commercial. It's gotten too big and too crowded. It's no longer authentic because it includes foods and products that aren't even Italian. It goes on for too many days." All of that may be true, but none of it is new. For decades the Feast has been commercial, and has included foods and products of many non-Italian ethnicities, including a mix of tradition and the contemporary. The New Yorker magazine in 1957 described what was then a six-day feast as "a scene of colossal, assured, offhand pandemonium." It was a cacophony of "zeppolo, hot pepperoni, pizza, Pepsi-Cola, sausage-and-eggplant sandwiches, lemon ice, cat-faced balloons, Confederate campaign hats, Japanese parasols, wedding dolls, chances on stuffed bunnies, chances on a Chevrolet, chances on dyed goldfish." The feast is too long, say the new neighbors, but it's always been long. In the 1950s it lasted for 6 days, and by the early 1970s it stretched over two weeks. That bigness used to be a source of pride for the city. 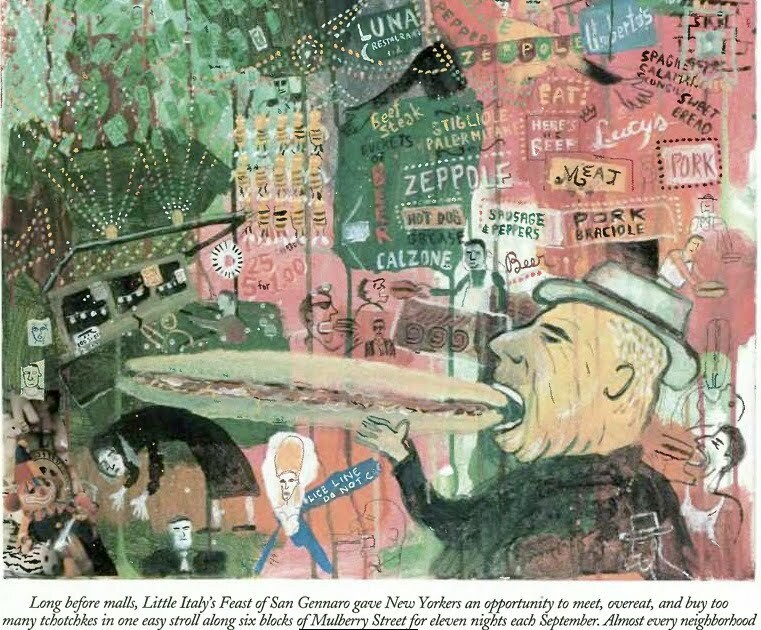 Said New York Magazine in 1972, "In Naples, where it originated, the feast only lasts four days. But, like everything else, it's bigger in New York and goes on for almost two weeks. Which leaves no excuse for missing it." And it's always been crowded, enough to induce a crushing feeling. A 1974 New York Magazine called it "no place for the fainthearted," due to the massive crowding. "Taken in the right spirit, however, it can be the city's most rewarding contact sport." 1984's Guide to Fairs and Festivals in the United States describes this "two-week festival" as a sprawling, jammed, commercial, diverse event: "More than 300 stands line Mulberry and adjoining streets. These stands sell all kinds of Neapolitan foods, pastries, and drinks. Over the years, other ethnic foods have been added, but the annual event that attracts the astounding number of over 2 million people remains a Neapolitan folklore event." To hear the opposition tell it, the Feast was a quaint, quiet, purely religious, two-day celebration until just a few years ago. Not so. So when did the city's opinion about the Feast begin to change for the worse? Calvin Trillin wrote a lovely piece for the New Yorker in 1981 in which he outlines everything that irritates him about the San Gennaro Feast (it's crowded, there are too many "rubes" from out of town, it includes the same stands and the same food as other New York street fairs, and it keeps pushing farther uptown), but then he goes on to say that he cannot resist attending it. He goes every year, admitting to himself "I rather enjoy pushing my way down Mulberry" at this special time. The emotional tide against the Feast really turned when the whole city turned, just a decade ago. We see a glimmer of it beginning in a multi-panel comic strip in the New Yorker for September 25, 2000. Among several delightful pro-Feast panels, artist Robert Grossman includes one panel of "minority opinions from neighborhood people." The panel shows a man who avoids the feast, along with an ice-cream eating, dachsund-walking young woman who simply doesn't like it. This opinion is no longer the minority. 2007 sign at Feast booth: "Be Nice!" "Nolita" was spawned in 1996, but it was in the mid-2000s, once its streets had been completely changed into upscale shopping malls and the luxury condos were securely in place, that it came into full bloom. And that's when the new, socioeconomically powerful neighbors turned on an already Giuliani-weakened San Gennaro. The anti-Feast attacks began to really heat up in 2007, when neighbors persuaded Community Board 2 to deny the Feast a permit. At that time, the Medici Foundation of Italian-Americans tried to fight back against the Nolita label, knowing that it meant death. As they wrote, "our ancestor’s neighborhood deserves the recognition and the honor by having their 'historic neighborhood' not be unjustly relabeled as NoLita for the economic gain by various city capitalists." Said a Community Board 2 member in 2007, "No one likes San Gennaro who lives here." As the Observer observed at the time, "The cultural enrichment provided by this perpetual al fresco experience may be lost on newcomers to the ever-changing neighborhood, where glitzy new luxury apartments are under construction... Still, it’s hard to imagine that the newly transplanted hushers and sanitation hawks could sway officials into yanking the street permits." One San Gennaro boardmember and long-time resident sees the current move to cut back the Feast as the beginning of the end. As he says, the Nolitans "want to turn Mulberry Street into Madison Avenue—it's a war on our culture." Little Italy and its big feast will lose that war. The flood has come. Wrote the Post today, "Little Italy is starting to look a lot like the Meatpacking District in its early days... 'In my view the Meatpacking District is kind of on its last legs,' says Mulberry Project partner Nick Boccio. 'The populace is migrating in this direction.'" "All other countried have festivals in NYC that go for ONE instead of the 2 weeks of filth and stench that the residentas of Nolita have to put up with." "Little Italy is a tourist trap with no real Italians living there. They should move the festival to Bay Ridge or Bensonhurst." "While I'm not totally against, San G, I think letting them take over a city street for 10 days is absurd. Give them a weekend to have their party." You can't mess with the Saints!! A neighbor from the old hood told me this a long time ago. Still pertinent. Not sure I posted the correct link to "Back"? just in case here it is again. I love the feast! I've gone every one of my 50 years. It wouldn't be right, just or even politically correct to shut it down. 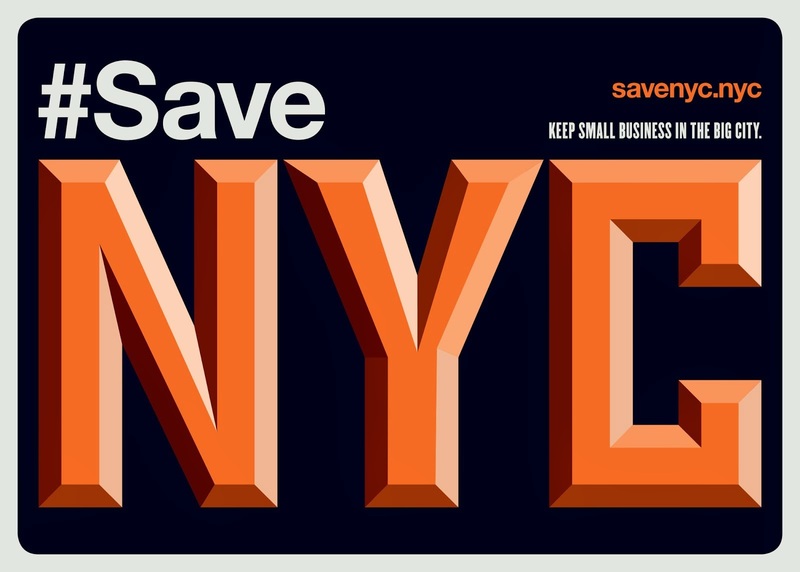 This is part of New York City's culture, and we're losing more and more daily with the influx of big-box chains, neo-hipsters and corporate greed. Curt, thanks for the link. astounding. You moved next to the airport and now you're complaining about the planes? I'm not crazy about street fairs, either, but you know what I do when one comes to Court Street near me? Also, I have no problem with Giuilani's crackdown on organized crime. Too often the mafia gets fetishized in NYC (including by Italians), and confused with ordinary Italian-American culture. I'd hate for people to believe that a crackdown on organized crime was somehow "the beginning of the end" for regular Italian-Americans in NYC. Let's not confuse that with the current assault by non-greasy-sausage-fingered wussbags who can't stand people having a good time! The murder of the Feast and whatever remains of Little Italy has been in the works for some time. What always fascinates is that hipsters love parties and noise and overcrowding as long as it's THEIR noisy overcrowded party. When it's a nearly century old ethnic festival, well then, that JUST WON'T DO. These entitled scumbags will soon have scrubbed the entirety of Manhattan clean of all genuine history and ethnicity. Chinatown is all that's left, and they're working on that too. This class of people is ascendant and reveling in their power and ability to transform this city completely in a very short span of time. Sorry to say it, but it's going to get much worse ( if that's possible) before the pendulum swings in the other direction. I just hope I'm still capable of enjoying it when it does, because at this point I feel like an alien in the city I moved to 23 years ago to escape the place I felt like an alien in. I've lived in SoNolita (southern Nolita, or "Little Italy" as it was once called) for over 30 years, on Mulberry Street. Many changes in that time, but this latest is the worst. I know several long-time building owners who are currently converting their basements into hipster hotspots. "It's where the $$$ is! Tourists don't spend anymore," they say. Goodbye, Feast! Farewell, Little Italy! The really cool feast, back in the day, was the feast of St Anthony’s on Sullivan Street in June. Pretty low key, not too many rubes, mostly locals, great gambling in the church basement. The new residents know the price of everything and the value of nothing. I love the Feast and look forward to it every year. It's one of the few things I can take part in that is connected the the history of Little Italy. As someone with ancestral roots in that neighborhood and as one who relishes in the cultural/immigration history of the city, the rapid disappearance of Little Italy is just sad and disappointing. The first time I saw a ferris wheel on Grand St, lifting people up and past tenement windows, I was thrilled and amused - I'm sure the apartment dwellers didn't like it, but come on, how only-in-new-york is that? im all for san gennaro but id like to see it transformed although admittedly i dont pay that close attention. as far as i can see its just another stop on the street fair calendar with the same old booths. very little of it screams "italian-american culture" festival. so if the local businesses took over the street (and they do to a minimal extent, id be all for it. it would be alot more interesting to locals and tourists a revivify a proud tradition. also if people like batali with the idea that it should maintain a certain modesty got involved, i dont think that would be antithetical to its spirit though some here might beg to differ. as for people whining about the noise and traffic, move to westchester. I have lived for many years (20+) on Mulberry street, and have to say I am one of those who hates the feast. That said, there probably is a middle ground. Given the original feast in Italy only lasted 4 days (as do most other neighborhood/cultural fairs), maybe that is a good middle ground. There is something just so overwhelming about essentially losing two weeks of September, that is what makes people "hate" it. Those people who say "avoid it" really aren't understanding we are talking about 2 weeks and 9 or so blocks,that is a lot, lot more than any other street fair in the city. Less days, less blocks is a fair middle-ground solution. It would be more tolerable and in line with other street fairs and cultural events. Anyone interested in San Gennaro should check out Abel Ferarra's recent documentary "Mulberry Street" which played at Anthology a few weeks ago. He shot it during the festival while he was living on that block sometime in the last 5 years or so. One of the big takeaways for me was seeing one of his Italian-American buddies who ran a booth, heading to a parking garage after the 10 days were over. He pulls out in a Hummer. NJ plates. The feast has always been a disgrace and an embarrassment to me. WTF is a Mozzarepa? Tell me! I have no idea. I say Canal to Kenmare, one weekend. Amen. If the organizers of the Feast hope to survive they should consider scaling back the length of it. That is a realistic expectation, and seeing as the original was only 4 days, I think cutting it short would go a long way towards rectifying the situation for now. As an Italian American, I actually don't consider the Feast particularly Italian at this point. It's roots are Italian, but it morphed into a uniquely New York street extravaganza some time ago. The organizers would do well to reemphasize the Italian, and scale back a bit, and maybe then they will stand a fighting chance in that neighborhood. I have very little sympathy for the relative newcomers of so-called Nolita, and the city's stupid vendor package deals that have homogenized all of the city's street festivals sure don't help. But the biggest problem with San Gennaro is that over the past few years the feast has gone from being a big, oversized, but still essentially neighborhood festival, to being little more than an excuse for suburban teens and twenty-somethings to come into the city, get stupid drunk, and act out in boorish and disgusting ways they wouldn't dare do back in Jersey or L.I. I have to admit I liked the festival more before I moved to Broome St & developed a bit of a NIMBY response to it: streets slick with vomit and, of all things, coconut milk, by the end of the first week. It's not just suburban teens but suburban 50-somethings who may have lived on the street as kids or maybe their parents did, who want to come in with license to yell in the streets in the middle of the night. In that way, it's like a more concentrated version of what the East Village goes through every weekend. Eventually I realized that the best way to "do" the feast was actually to brave the crowd and spend a little time down by the church--catch the parade if you can--or at the stage, where some good old school Sinatra singalongs take place, lots of old timers in the folding seats. Those bits make it feel more like a neighborhood affair with some distinct flavor. Also, the new Italian American Museum on Mulberry is worth the hour or so you'll spend there. Nolitans--including an influx of Italian Italians (along w/ lots of other Europeans)--would benefit from knowing the neighborhood's history. Oh, and Umberto's closed. I don't remember anyone taking notice, which is too bad. May not have been the best food, but 1/2 dozen oysters for $8 was a pretty good price. Like everything else in the city, the San Gennaro Feast will be sanitzied away. I'm pretty sympathetic to the persepective of this blog and most of its commentators, but the attitude that "well, this has been going on in New York for several decades now, so the city loses something if it goes" is its weak point. As a more general point, things have "vanished" from New York at a more rapid rate than in other cities throughout its history, the difference in this decade is that in the past, new stuff has arisent o replace the old stuff that was also interesting, while this time the new stuff is pretty much exactly what the rest of the country is getting. More specifically, there is all sorts of crappy things in this city that should change. This street fare happens to be one of them. Its not been authentic for some time -actual Italian Americans are embarrassed by it- and its "culture" is that of the Jersey Shore. It has quite a bit in common with the suburban kudzu that this blog usually criticizes when it appears here. It just happens to be a relatively early example of the suburbanification of New York, so I guess it gets a pass. Having lived on Mulberry St. for over 30 years, I can attest to the fact that this event used to be louder, and last later into the night, than it does now. But it's still a terrible nuisance to those of us who live there. It isn't the street closings or the "Jersey Shore" types who flock to this, it's the slick of grease on the streets and sidewalks starting a couple days in, you could break your neck just trying to get to work the next morning. And MOST OF US WHO LIVE IN THE NABE today work in the professions, media, communications, the arts, education, etc., and it is now OUR NABE, ours, and we are not "johnny-come-latelies" or "elitists," or any of that other bogus, pseudo-Joe the plumber crap I'm hearing. Oh, did I mention the EXPLOSION of vermin that clicks in like clockwork by the beginning of November, as the mice and roaches beget unto the next generation ad infinitum? Nothing like a lot of free food lying around in the streets to encourage that. All ye who claim to be for the good old authentic New York, I know you don't live in Little Italy, tell you what, how about if we move this crummy, touristy, inauthentic into your nice neighborhoods, okay? i'm sure i'd be irritated by it, too. the issue here is that the complaints to the city to shut it down, or cut it back, are a very recent phenomenon. the complaints come largely and most loudly from new, upscale "Nolita" boutique owners and they are filled with classist statements. the feast may need to change, but many of the arguments made against it reveal an entitled attitude far more repulsive--and more pervasive citywide--than the grease on the sidewalks. Fratta recounted a visit he made to a handbag designer north of Kenmare. When he suggested they could profit off of San Gennaro and the multitudes of people the festival attracts to the neighborhood, Fratta said he was told, 'those aren't our clientele.'" Fratta also says "They want to turn Mulberry Street into Madison Avenue — it's a war on our culture." The NYMag article also notes that the "Most Precious Blood Church, home parish of the 78-year-old San Gennaro Feast, is down to about 400 members, according to its pastor, Father Fabian Grifone. The church is said to subsist mainly on revenue generated by the feast and the sale of religious statues, jewelry, and other items from a stand on Mulberry Street." I'm all for change in NYC, but not at the expense of erasing the past. It would be ideal for the festival to be adapted to something that's a fair balance. I love the celebration, the festivity, the lights and the gathering that San Gennaro brings. It's not like all the other festivals, especially with the vibrancy of crowded outdoor cafes where you see the waiters well-dressed, while stuffed animals are waiting to be won for a girlfriend or son or daughter. Is that carnival strong man bell game still there? I'll have to go back. The forces around San Gennaro are not unlike the forces that surrounded and are erasing Coney Island. It's just not a corporate beast, but luxury retail one. The authenticity issue is indeed crap and put forward by people who don't know the history of street fairs and Italian feasts. Around 1917, my grandfather (who was born in Italy) and my dad began working the circuit of feasts, street fairs and field days in CT & NYC. These events were always commercial and featured whatever was novel at the time. For example, one day my dad sold photos of an aviator whose name was in the headlines at the moment. Another time he had a camera and took "one minute" photos. They sold food too--and it wasn't Italian. It was carnival food--popcorn, peanuts, candy apples because my family was in the carnival business. 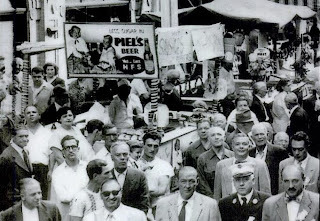 In early photos of street fairs, one can see sideshow banners, games, and early rides such as a Ferris wheel or merry go round. In fact, the very first organized carnivals got their start at these feasts. As a former carny kid, I've always loved San Gennaro because it's one of the few remaining Italian street festivals in NYC where you can still find rides & sideshows and an authentic carnival atmosphere. Except now "carnival atmosphere" is being used pejoratively. The feast has been around for a very long time. It is something I enjoy and am very proud of.When these people moved into the neighborhood they knew about the feast.If you do not like it then I suggest you move!! Feast Alert! On the 16th, TCM is airing Morris Engel's magnificent "Weddings and Babies." (The title refers to the main character's occupation as a photographer.) Besides being a seriously beautiful picture, you can enjoy the Feast in 1950s black and white. I wonder if this feast were Hispanic if the city would accept the anti-feast movement? No way? Once again, anti-Italian. The solution, bring back the "mob" to the feast. They will make the "store keepers" an offer that they "can't refuse." Having lived in the neighborhood for over 30 years I, like DiNiro in Mean Streets, hate it with a passion. (Hey, he played a Sicilian from Elizabeth Street: their small feast took place about a week later. That saint is now reduced to a booth at San Gennaro's). Still, it is part of the neighborhood and you live with it, hoping to come across a zeppole stand as the dough is just coming out of the oil. there already IS a Feast in Bensonhurst...just last week actually. 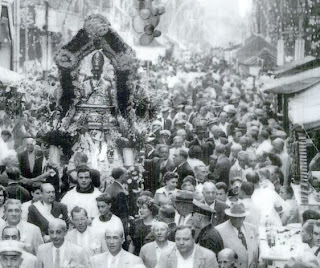 Festa di Santa Rosalia. And the San Gennaro IS NOT a STREET FAIR. Theres a religious significance as its basis. Hence the various ceremonies and Processions. Wow, I can't believe the negativity of some of the comments and the ignorance of the posters who say the feast has nothing to do with Italian American heritage. Why don't you participate in the Mass at Most Precious Blood Church or the procession? I'm shocked by the last comment in the blog post referring to Italians as "them." Would we refer to any other ethnic group as "them"? I don't see a problem with having the feast for two weeks. There are many annoying things in this city--like citibikes and pedestrian plazas--but we live with those things because guess what? You can't please all the people all the time. Personally, I don't like the fact that the city is turning into an upscale shopping mall. And the feast is one way of holding onto tradition in the face of this change. In my opinion, the issue is classicism, and the arguments against the feast sound like ethnic prejudice to me.